John Sinclair, “Michigan’s hippie king,” walked out of Jackson’s State Prison of Southern Michigan on Dec. 13, 1971 after serving two-and-a-half years of what might have been a 10-year prison sentence for marijuana possession. Surrounded by a cheering crowd, a television reporter quizzed Sinclair as he embraced family and friends outside of the prison gate. “I wanna smoke some joints, man!” Sinclair interrupted. 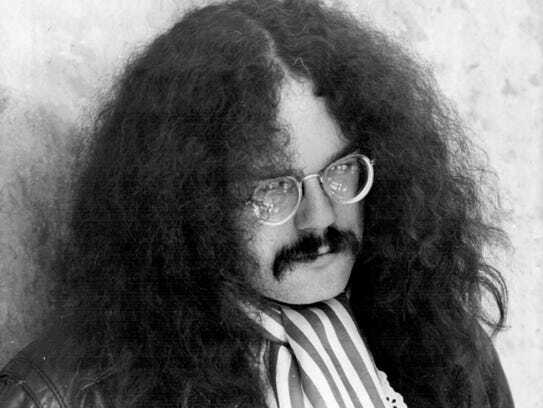 Standing well over 6 feet tall with a mane of curly dark hair, Sinclair was a minor celebrity in Michigan’s counterculture: the manager for the Detroit rock band MC5 and the gregarious chairman of the White Panther Party, a revolutionary organization named in solidarity with the Black Panther Party. He proclaimed that marijuana was safe, the government was oppressive and young people were going to take over the country. The press characterized him as “colorful and quotable.” Police labeled him a threat to public safety. The Michigan Supreme Court found him convincing. 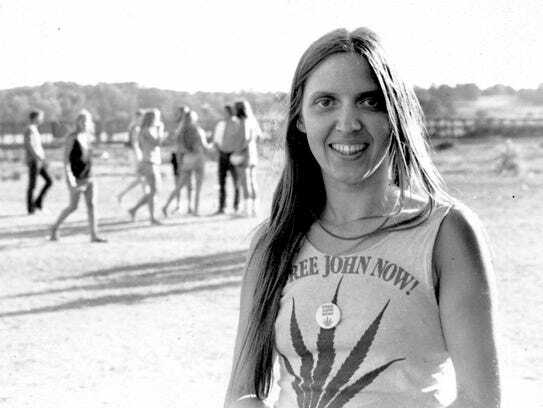 The court fight that followed Sinclair’s arrest for marijuana possession in 1967 — and the “Free John Now!” publicity campaign launched by artist and activist Leni Sinclair, who was John’s wife at the time — briefly overturned Michigan’s marijuana laws and gave hope to Michigan’s more optimistic marijuana enthusiasts that legalization was within reach. “We were such utopianists,” Leni Sinclair recalls. The Sinclairs helped to launch the Michigan Marijuana Initiative in 1972, the state’s first serious effort at marijuana legalization. It failed, of course. Legal marijuana was a hard sell to a public that largely believed smoking reefer was immoral and dangerous. A 1969 national survey indicated that 84% of Americans thought marijuana should be illegal. By 1972, things hadn’t changed drastically. In November, the Coalition to Regulate Marijuana Like Alcohol submitted around 360,000 petition signatures to legalize the consumption, production and distribution of recreational marijuana in Michigan. It is all but assured that the ballot proposal will reach the 250,588 valid signatures necessary to make it on the November ballot. With nearly 60% of Michiganders in favor of legalization, it’s also expected to become law. Which might sound like vindication for Leni and John Sinclair. They don’t see it that way. Both say smoking marijuana in the 1960s was an affirmation of a fiercely do-it-yourself lifestyle and a form of protest against a national culture that sanctioned discrimination, demanded commitment to American militarism and protected individual liberty only within the bounds of consumer capitalism, Christianity and the nuclear family. 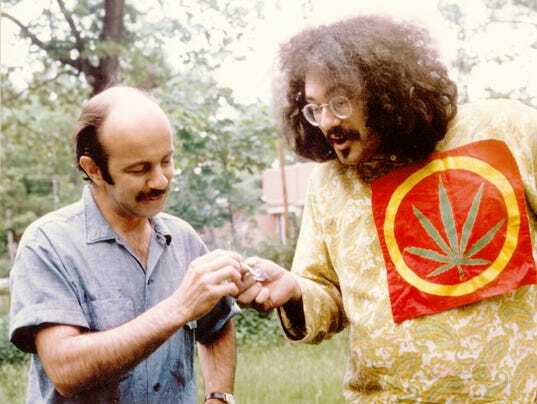 “They are subverting the whole marijuana culture that we created, which was based on sharing, noninterference with others, high-mindedness, and spirituality,” said John Sinclair, from his upstairs apartment office in Detroit’s Cass Corridor. At 76 years of age, he is still heavily involved in marijuana legalization efforts. He and Leni have been divorced since 1988. “At first I thought it was a good thing” to legalize marijuana, said Leni Sinclair, who has been arrested five times on marijuana-related charges over her 77-year life. “In retrospect,” she said, when medical marijuana was legalized, “it destroyed the whole distribution system” that consisted mostly of friends getting together to share weed and hang out. 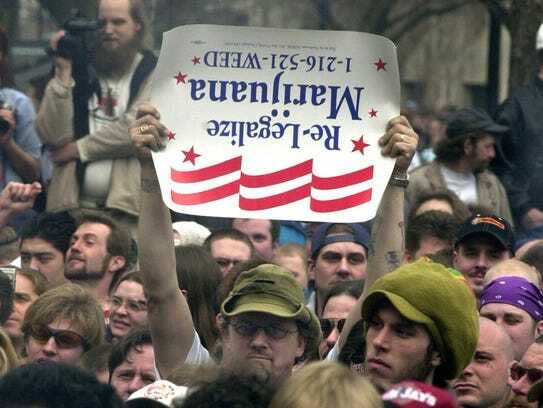 They agree nonetheless that legalization is long overdue. “People are just ready for it,” said Jeffrey Hank, the Lansing attorney who founded MI Legalize, a grassroots organization that almost succeeded in getting an initiative on the ballot in 2016 to legalize recreational marijuana. The failure of the 2016 initiative inspired Hank’s organization to found the Coalition to Regulate Marijuana Like Alcohol, up their fundraising efforts and professionalize their campaign. The Coalition is a diverse collection of activists, farmers and investors from both large companies and small businesses such as Lansing’s Wholesale Hydroponics. Its three largest donors have been the retail tobacco chain Smokers Outlet, the national lobbying group the Marijuana Policy Project and MI Legalize. And its efforts are aimed squarely at the political mainstream. The initiative includes a 10% excise tax on marijuana sales that would be divided between schools and road repairs and the municipalities where marijuana businesses are located. Its campaign has focused on the failure of efforts to prohibit marijuana use — one ad shows a Prohibition-era photo of men pouring a beer barrel into a storm sewer beside the caption “Insanity: Doing the same thing and expecting a different result” — and on “unnecessary” arrests. “You never get everything you want when you try to get something of this nature done,” said Hank. In the 1950s, Michigan implemented some of the harshest penalties for marijuana in the country. Legislators worried publicly that “dope peddlers” and “bad associates” — which their listeners would have understood as code for black and working class — were manipulating white youth to smoke marijuana. A 1952 bill made the punishment for narcotics possession anything between probation and 10 years in prison, and the law treated marijuana as a narcotic. A second offense could mean 20 years behind bars. A conviction for selling carried a mandatory minimum of 20 years in prison with no parole. In practice, these laws intensified the aggressive policing aimed at Michigan’s expanding black neighborhoods. By 1956, the Detroit Narcotics Bureau estimated that 89% of people arrested for narcotics were black, though they were only 20% of the city’s population. The conviction rate was a staggering 90%. When white and college educated John Sinclair was first arrested for “sales and possession” of marijuana in October of 1964, he got a slap on the wrist. The judge dropped the sales charge, put him on two months’ probation and fined him $250. 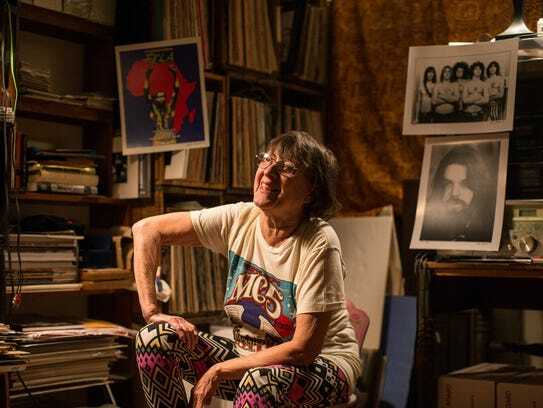 Still on probation, Sinclair started a Detroit chapter of LEMAR (which stood for “Legalize Marijuana”), the first group dedicated to legalization in the U.S.
John and Leni Sinclair had recently helped found a beatnik-inspired artist collective called the Detroit Artists’ Workshop. Their commune became a home base for artists, musicians, activists, and entrepreneurs. The Detroit Police assigned an undercover agent to infiltrate the commune to keep tabs on Sinclair and the anti-Vietnam War activists who lived in the same building, which led to Sinclair’s second arrest. He pleaded guilty to marijuana possession and, this time, was sentenced to six months in the Detroit House of Corrections. Sinclair’s third arrest came under the auspices of a drug raid targeting narcotics traffic near Wayne State University’s campus. A month prior, he had given two joints to undercover police who had taken jobs at the commune in order to build a case against Sinclair. John vowed to appeal his conviction by challenging the legality of the state marijuana laws. Two years later, Judge Robert J. Colombo of the Detroit Recorder’s Court sentenced John Sinclair to nine-and-a-half to 10 years in prison. He also denied bond, which would have allowed Sinclair to stay out of prison during the appeal process, a move usually reserved for the most dangerous offenders. “The law means nothing to him and to his like,” Colombo said. Leni was “stunned.” She began urging voters to write members of Congress, participate in demonstrations and join her petition drive to change the marijuana laws. Though they did step outside the law to make their point. Leni and a few friends rolled a pile of joints and mailed two apiece to every member of the state legislature, Gov. William Milliken and Wayne State University President William Keast with a note explaining that they were now in possession of narcotics and subject to a ten-year prison sentence. Ann Arbor was a strong base of support for their efforts. So was East Lansing. Students at Michigan State University swayed Republican Senator, Philip O. Pittenger, who represented East Lansing, to vote for a more lenient drug bill. The East Lansing City Council passed a resolution recommending Sinclair’s release from prison and the same for all Michiganders imprisoned for marijuana crimes. The “Free John Now!” campaign culminated in the “John Sinclair Freedom Rally” on December 10, 1971, headlined by John Lennon. 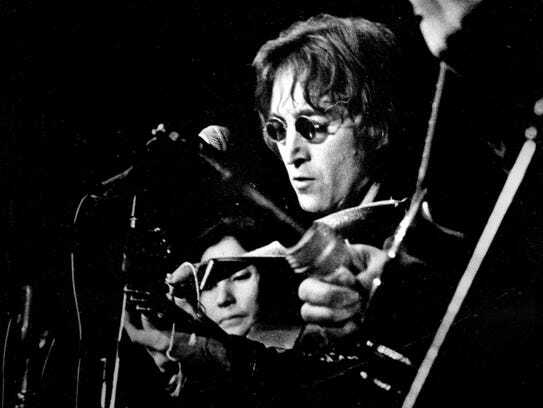 Lennon and Yoko Ono took the stage around three in the morning with a dobro guitar and an impromptu band. They closed their short set with a song written especially for the occasion. “It ain’t fair, John Sinclair, in the stir for breathing air,” Lennon sang. Three days later, John was free. His case convinced the Michigan Supreme Court that marijuana and heroin were not equally dangerous, though state law had treated them that way, misclassifying cannabis as a narcotic and imposing long sentences for possession and sales. The Court released Sinclair from prison and, three months later, declared the state’s marijuana laws unconstitutional. There were no new marijuana laws in place, and so, in March of 1972, marijuana was effectively legalized in Michigan for about three weeks. To celebrate, several Ann Arborites half-jokingly advertised a “hash festival” to take place on the University of Michigan’s Diag the day the new marijuana law was to go into effect — April Fool’s Day. Hundreds of people showed up on the snowy Saturday to puff joints in public, the origin of what would become Hash Bash. No one was arrested. A few days later, the court ordered the release of 128 people in Michigan jails for marijuana offenses. 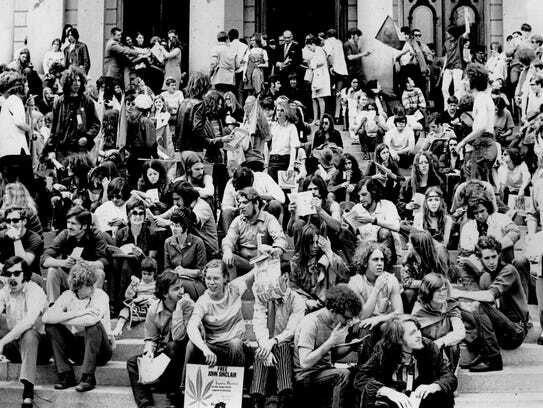 Pressured by young people, Congress had passed a constitutional amendment in 1971 to lower the voting age from 21 to 18, the same age at which Americans became eligible for the draft. Hoping to capitalize on the momentum, the Sinclairs devoted their energies to registering young voters. Nancy Wechsler and Jerry DeGrieck, both 22, won seats on Ann Arbor’s City Council in 1972 and immediately introduced an ordinance that would downgrade possession, use and sale of marijuana to a $5 civil infraction within Ann Arbor. East Lansing quickly became the second. The Sinclairs began working furiously on a Michigan Marijuana Initiative that mirrored an ongoing campaign they had worked on in California. It called for “free, legal, backyard marijuana” through an amendment to the Michigan constitution. The blueprint they settled on was “don’t do anything but legalize it,” Leni Sinclair said. They had two months to collect 265,000 signatures to put the proposal on the November 1972 ballot. roughly 125,000, less than half of what they needed. Only around 40,000 of those were considered valid. The End of Marijuana Prohibition? In 1973, Ann Arbor’s newest state representative, the shaggy-haired Perry Bullard, invited his colleagues in Congress to attend the city’s 2nd Annual Hash Bash, where Bullard smoked a joint in full view of the media. “There’s nothing wrong with it,” he said. Former Lansing Mayor Virg Bernero didn’t smoke a joint for the cameras and said he “got almost no contact buzz” when he spoke Hash Bash in 2015 to promote “sane, sustainable, enforceable policy” regarding marijuana. Bernero said he hoped to combat “misinformation” about marijuana, which he equated with the “reefer madness” propaganda of the 1930s. Bernero supports “normalization and legalization” of marijuana, noting that it’s “less fatal and less problematic in many respects than alcohol,” and he sees its potential to bolster both local economies and hard-pressed municipal budgets. Timothy Locke shares those concerns. Locke is the treasurer of Abrogate Michigan, which is running a separate petition campaign to legalize recreational marijuana but without an excise tax. The organization is pursuing a constitutional amendment, which is not expected to make it onto the ballot. In other states that have treated marijuana like alcohol, the excise tax “has not slowed down the arrests” and has actually “emboldened the black market because if people can find a cheaper product, they will,” he said. Which Lowell concedes is a possibility. For most, these concerns are offset by the benefits of funding Michigan’s public schools and road repairs through the excise tax on legal weed. Jeffrey Hank touts the model of marijuana licensing in the ballot proposal as the most small-business-friendly of any state. The “microbusiness” licensing process — akin to that of microbreweries — will allow small business owners and entrepreneurs to get a fair share of the market, not to mention giving them protection under the law. However, licensing fees for the smallest dispensaries still exceed $10,000 and a “no felons” clause limits access to the market. As a result, the black and working-class communities most victimized under marijuana prohibition could be largely excluded from the legal marijuana industry. She wonders “how much would it have cost the state of Michigan to house all these prisoners for 20 to life if we hadn’t changed the law?